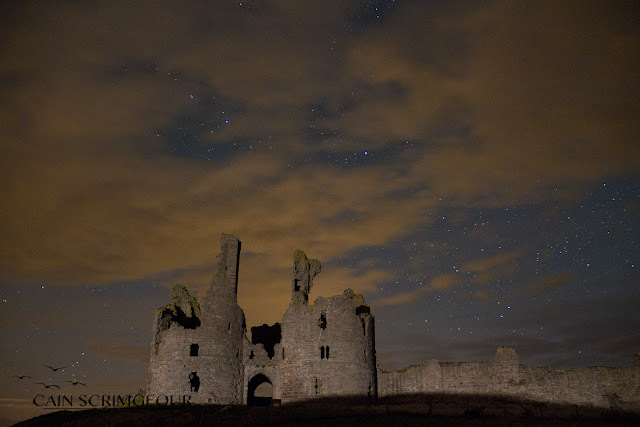 Last night I headed up the coast to Dunstanburgh Castle with the aim to capture a star time-lapse. Parking in Craster Harbour and wandering up towards the castle at about 21:00 a few people headed in the opposite direction. On reaching the castle I scouted out the best position, setup my gear and waited. Clear skies were awaiting, as the light steadily faded a Barn Owl hunted the grounds, with emerging Pipistrelle type bats. I started the time-lapse at 23:30 and settled down for the two and a half hours it would take to complete. An hour or so in a light appeared from the harbour, presumably a boat, suddenly lighting the entirety of the castle. The resulting effect can be seen below. Back on patch a lone Black-Necked Grebe still lingers. S P O O K Y !! Like some old Hammer Horror scene. Quite spectacular. That would make for a great book cover to a novel! Cracking shot Cain can you explain the 2 1/2 hour time lapse are these stills which then become a video. Cheers Brian, the 2 and a half hour time-lapse is to create roughly 10 seconds of footage. Each picture is a 30 second exposure with an interval of 3 seconds between each shot, TV runs at 25 frames per second so your looking to get at least 250 stills. It's a long process !